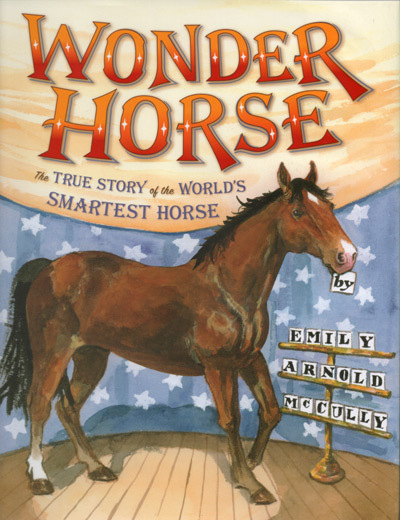 From �Publishers Weekly: "A horse that recognizes the alphabet, fetches, and dances takes center stage in this true story from the late 19th century. McCully's tale is as much about the beloved and clever animal as it is about his owner and trainer, Bill Key. McCully �brings the story to life through her watercolors, especially vignettes of Jim playing fetch and learning the alphabet. �Jim and Doc Key are a testament to hard work and the nascent movement for humane treatment of animals." From The Bulletin of the Center for Children's Books: "Jim Key was, at the beginning of the twentieth century, one of the best-known horses in America, and his owner and handler "Doc" Bill Key one of the most respected and successful African-American businessmen. Doc Key taught Jim how to identify letters and perform mathematics, and the horse turned into not only a famous stage show but also the poster pony for kind treatment of animals ("Jim Key Educated by Kindness," read the newspaper headlines). Young animal lovers will appreciate this as a readaloud as well as a readalone, and it could slide in as an intro to a discussion of Barnumesque period showmen and spectacle. A brief bibliography is included."